Have I mentioned that I am going to be a grandma any day now? I’m sure I will have a few photos to share. Hopefully my recipe blog will not morph into a grandma blog. I will try to restrain myself. I don’t normally make up recipes, but I have been frequenting Starbucks lately and they have a wonderful fall drink that is Salted Caramel Frappuccino. It is really good. 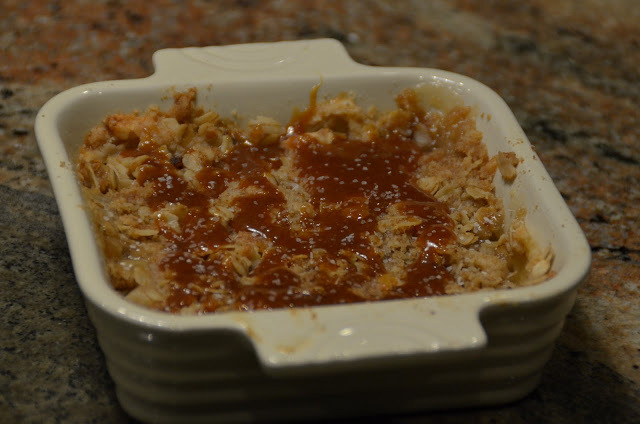 So it gave me the idea to salt my apple crisp. I tested it 2 different times and got it right the second time. And I must say it is very good. (if I do say so myself) I used Golden Delicious apples the first time and then used Granny Smith the second time and it was much better the second time. The Grannies are much more tart and it really goes well with the sweet and salty. 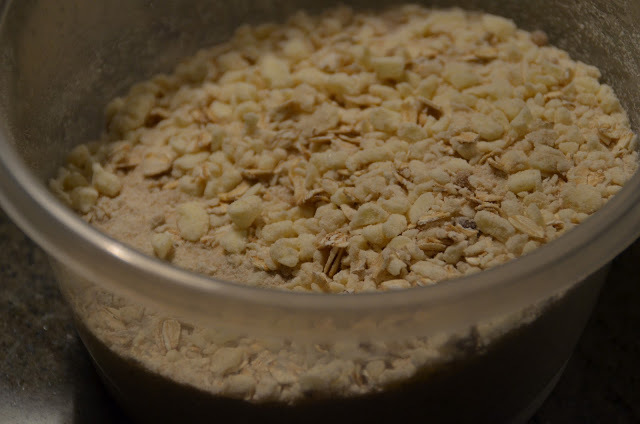 Add 1 cup old fashioned rolled oats. I used Smuckers Special Recipe Butterscotch Caramel. Mrs. Richardson’s is also very good. You will use about 1/2 cup. Place butter and rest of dry ingredients except the oats, in a food processor and pulse until butter is pea sized. Then add oats and pulse once or twice. Or you can cut the butter into the dry ingredients with a pastry blender or 2 knives. This makes about 4 cups of crumb topping. I usually make all the topping and refrigerate what I don’t use. It will keep for 2 or 3 weeks, but don’t worry you won’t wait that long to make it again. If you would rather, you can cut the recipe in half and it will make a pie plate or 8X8 baking dish. All the topping is enough for a 9X13 or very large round baking dish. 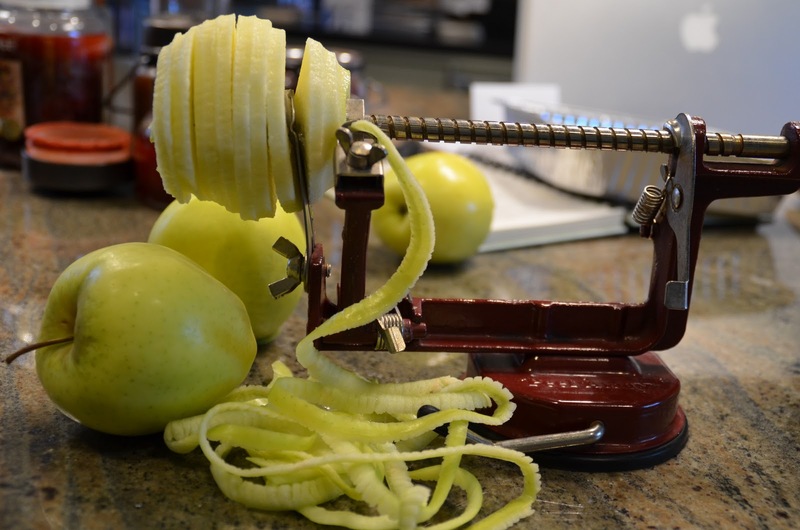 Peel and slice one Granny Smith apple per person. Cut slices in half. Place in bowl and add 1/2 Tbsp. 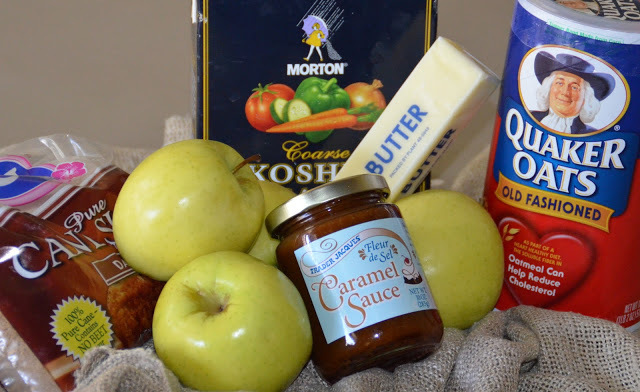 flour and 1 Tbsp of sugar per apple. Toss to coat. Place in a baking dish. Drizzle with Caramel ice cream topping. About 1/2 Tbsp per apple. Then top with 1/2 cup of crumb topping per apple. Bake 45 minutes at 350 degrees. Or until topping is golden brown and juice is bubbling around the edges. The largest one may take up to an hour. Some apples take longer to bake. Let cool for about 30 minutes. Drizzle with more caramel. Put 1/2 tsp. to 1 tsp. of Kosher salt in the palm of your hand. Sprinkle crisp evenly with a very small sprinkle of salt. Serve warm with vanilla ice cream. Do not substitute table salt. You may use sea salt. Whip cream with an electric mixer. Add powdered sugar and vanilla just before soft peaks form. Fold in caramel ice cream topping, leaving a marble of caramel. Garnish with a sprinkle of kosher salt and a sprinkle of raw sugar.